Hustle Boss recently swung through the Las Vegas Fight Club, as junior welterweight upstart Cameron Kreal put in some work ahead of his July 24 return as Sam’s Town Casino. Kreal (7-7-2, 1 KO) is coming off of his biggest win to date, a 1st round TKO over always-game Moris Rodriguez. The fight figured to be competitive but Kreal broke through early and didn’t surrender his momentum in dropping and finishing Rodriguez. 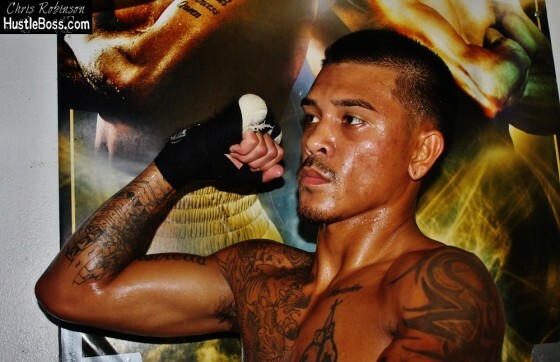 The Filipino-born Kreal grew up in Hawaii and has embraced Las Vegas as his adpoted hometown. Stay tuned for word on Kreal’s opponent as well as all the other matchups on the July 24 show and look below for video highlights of Kreal and his Uncle and trainer Jayson Gallegos putting in work.